Ethelred Tressider is a hack writer and he knows it. His latest crime novel is stuck somewhere between his brain and the keyboard, his agent, Elsie Thirkettle, treats him with disdain and his ex-wife has just turned up murdered inconveniently close to his Sussex home. Badgered by the unrelenting Elsie, Ethelred embarks upon his own investigation into his ex-wife’s disappearance and murder. However, as the clues begin to pile up, Elsie starts to wonder if her client’s alibi is not as solid as he claims. Ethelred is mild-mannered, naïve and frequently exploited by almost everybody around him. His writing has hit a brick wall and he is fast approaching mid-life crisis. Elsie is a foul-mouthed, bullying, over-weight chocolate addict, whom I was determined to loath. Yet, by the novel’s end, I was beginning to feel some empathy towards her. Okay, I liked her. I liked her dogged determination and her honesty. Her vulnerability shone through the irascibility and she had moved from caricature to fully rounded personality. Written in a cleverly crafted dual first person dialogue, we are party to the thoughts of both Elsie and Ethelred, yet still, somehow, LC Tyler manages to keep the solution to the mystery a secret right to the last pages, even while peppering the text with clues and, of course, red herrings. I also enjoyed the passages where we get to read what Ethelred is writing: his own melancholy is mirrored in Fairfax, his character’s thoughts. Tyler does not write like a first novelist. 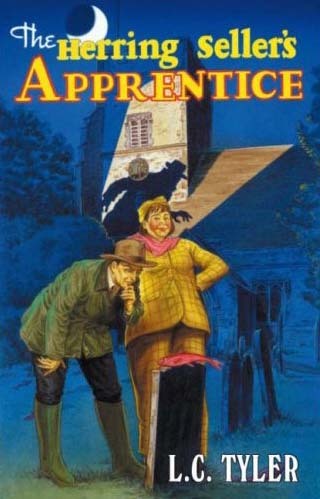 ‘The Herring Seller’s Apprentice’ is an assured and beautifully written debut, told with humour and an impressive lightness of touch. It works both as a detective story and a comedy. And by the way, if Dawn French wants a complete departure from the Vicar of Dibley, and if anyone at the BBC ever commissions this as a feature film, then the role of Elsie Thirkettle should be hers and nobody else’s. In my humble opinion, of course.